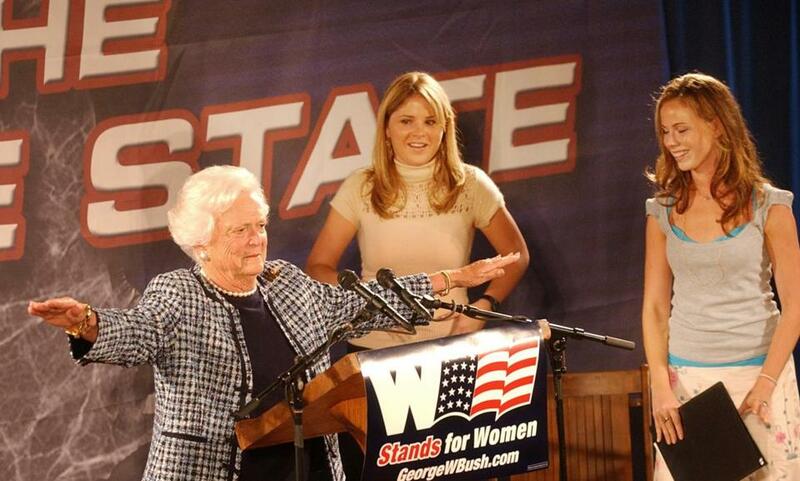 Jenna Bush (center) campaigned with her grandmother in 2004 in Exeter, N.H.
HOUSTON — Former first lady Barbara Bush, who has been reported to be failing health, is in ‘‘great spirits,’’ and the family is grateful for the many expressions of support it has received, her granddaughter Jenna Bush Hager said on Monday. Bush family spokesman Jim McGrath said in a news release Sunday that ‘‘Mrs. Bush, now age 92, has decided not to seek additional medical treatment and will instead focus on comfort care’’ at home in Houston. McGrath did not elaborate on the nature of Bush’s health problems, but on Monday he said she has suffered in recent years from congestive heart failure and chronic obstructive pulmonary disease. She also has been treated for decades for Graves’ disease, a thyroid condition, had heart surgery in 2009 for a narrowing of her main heart valve, and was hospitalized a year before that for surgery on a perforated ulcer. Hager, an anchor on NBC’s ‘‘Today’’ show, said on the program Monday morning that Bush is resting comfortably with family.